The motor vehicle is an unfortunate condition of our society and it’s not something we can easily let go based on our history. But I made a conscious decision [to live downtown] because I didn’t want to rely on a motor vehicle. I wanted to walk the walk not just talk the talk. – Brian Genovese, Head of the Multi-Modal Section at the City of San Diego’s Transportation Engineering Operations Division. Two Fridays ago, I sat down with Brian Genovese to talk about the city’s new focus on bicycles. 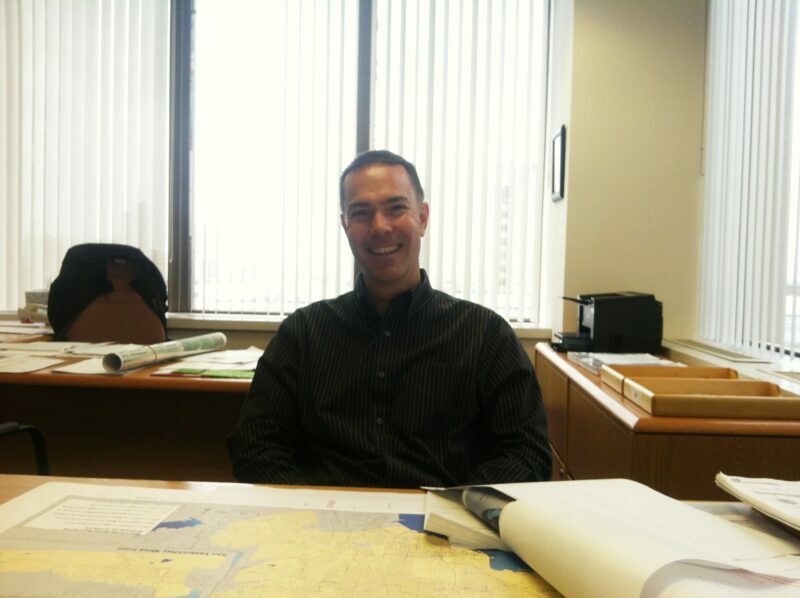 Genovese is a Senior Traffic Engineer in the Transportation Engineering Operations (TEO) Division in the City of San Diego. Since being made the head of the newly created “Multi-Modal Section” within the Division earlier last winter, Genovese has been busy working on getting a handle of the opportunities available to make changes within our transportation system to emphasize multi-modal transportation: bicycling, walking and transit issues. Brian Genovese in his corner office. The City’s Transportation Department has undergone some changes in its organizational structure over the last year. When Genovese was hired a little over a year ago, Linda Marabian was the Acting Deputy Director of Transportation. When Marabian became the permanent Deputy Director she reorganized the Department to emphasize the multi-modal program. The idea behind Marabian’s vision was to ensure that her department focused on all modes of transportation and not just the motor vehicle. The focus thus changed from a fragmented and reactive approach to a more proactive method of dealing with the transportation system in the city. Marabian’s vision was to bring the appropriate staff together to highlight the city’s commitment to multi-modal transportation. Originally from the Lakewood/Long Beach area, Genovese went to college at UC Irvine, often commuting by bicycle, and left with a civil engineering degree. He says the draw to civil engineering came from a childhood interest for building things and “being good at math”. As an adult, he understood the practitioner’s side of things and wanted the tools needed to build things and says that he was drawn to the idea of using existing “resources to build what he [could] for the betterment of society.” That coupled with him wanting to be a steward of the community drew him to the government sector. After college, Genovese began working for the City of Bueno Park. After becoming a father, Genovese and his wife decided they wanted to raise their children in a different environment and moved to Oregon which, to Genovese, “seemed like a really nice place”. So the Genovese family moved up north in 1995 and lived there for sixteen years before being lured back down to Southern California’s great climate to tackle the challenges presented by the nation’s eighth largest city, San Diego. After a decade in the government sector, Genovese dabbled in the private sector for a short stint but returned back to government when the City of San Diego offered him an opportunity to make a difference. One of the opportunities that Genovese and his team has seized upon is working alongside the city’s fast moving overlay and slurry seal program to implement bike facilities. To that end, Genovese and his team have spent a lot of time reviewing the existing conditions and their focus has been on looking at the city projects that are about to receive an overlay of the street not unlike how Bryan Jones and his team have been making room for bicycle riders up in Carlsbad. The focus of the Genovese’s team has been to implement projects that Genovese has repeatedly referred to as “low hanging fruit” – striping new or restriping old bike lanes to be better in conjunction with and alongside ac overlays or slurry sealing of our city streets. Genovese’s goal has been to review the opportunities available through the city’s overlay efforts and implement change to provide better bicycle facilities. This includes implementing new facilities where they don’t exist (assuming they comply with the City’s Bicycle Master Plan). The reason they are considered low hanging fruit is because Genovese sees them as opportunities to make a big change with very little effort. Genovese sees this as such a simple step but something that makes a major statement to the bicycling community and that also supports the city’s new focus on making San Diego more bicycle friendly. At the same time, Genovese has also been looking at capital projects and evaluating the city’s bicycle master plan since many projects within the bicycle master plan have to go through the CEQA process. The 2011 Bicycle Master Plan is scheduled to be formally adopted by City Council toward the end of June this year once the plan finishes with its CEQA requirements. Genovese was able to shed some light on what the holdup was. According to Genovese, when a planning document includes recommended projects, the projects need to identify the impacts to a community as a whole based on CEQA requirements. If you’ve been reading our news roundups that Chip Sanders has been publishing weekly, you know that this is an issue affecting the entire state and CEQA is currently a hot topic that is long overdue for some reform since it is creating a lot of unnecessary headaches for bike advocates and other folks who are advocating to get bicycle facilities implemented on the ground. Everyone should help identify “low hanging fruit” by checking out the “Pavement Condition Map” (http://bit.ly/SA3TXX) and look at the routes that you ride. Click on each street and find out when it is planned to be overlayed or slurry sealed. If they are planning to do maintenance on a street that you know could use a bike lane or better bike lane then contact the multi-modal division and request it. Michael – do you know where to find the contact information? I’m unsure of the correct person / department name for this sort of request. Awesome – exactly what I was looking for. Thank you! Also, good call on the cc.